And (spoiler alert) Christmas is all about selling you stuff. Retailers are having the time of their lives, but they’re also facing cut-throat competition where only a perfect little Penguin will do. Everyone’s trying hard for a heartwarming Christmas ad. But not everyone’s doing a great job. I’m not saying Jehovah’s Witnesses have got it wrong. That’s the first thing I wanted to say. This isn’t about religion, or about what you should believe in. 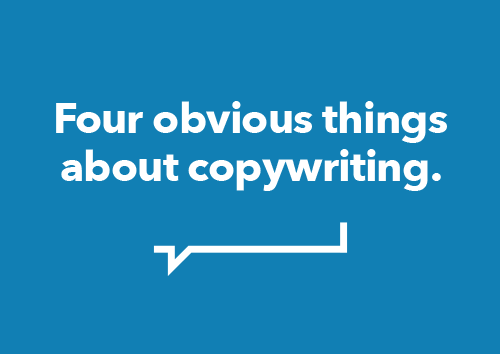 It’s about copywriting (which I suppose is what you’re expecting). But being a copywriter is being able to sell, at least in part. It’s about telling people about something you have to offer, explaining how it will help them, and pushing them to take action on it. To buy it. Or buy into it. Recently, I had regular visits from a Jehovah’s Witness. I kept inviting him back because, truth told, I wanted to take the opportunity to ask him about lots of things I never quite understood. Why can only a certain number of people get into heaven? If that’s the case, why are you telling everyone to join up? He cleared things up. He answered my questions. But, above all else, he was trying to sell me on an idea. And I think we could all learn a thing or two from his techniques. Copywriters and creatives debate negativity and positivity all the time. I’ve heard respected freelance copywriters say you should never use negative words. Never say bad. Never say never. But most people make exceptions when it comes to certain industries. If you’re writing about health, security, or safety, emphasising the negative emotions can really help to solidify fears and drive people to take action. The problem is it feels a bit dirty. Just this week, I was interviewed by Glenn Fisher at All Good Copy. We talked about everything from my unusual approach to planning to my favourite words to use in copy. Then, we got onto the subject of whether negative or positive emotions work best. So, for this Swiped post, I wanted to use one of my favourite examples that shows how people respond to a positive attitude – even if you’re talking about something that’s quite frankly terrifying.